Many questions on electromagnetic induction have been discussed on this site earlier. You can access those questions by clicking on the label, ‘electromagnetic induction’ below this post. Today we shall discuss a few more questions in this section. (1) An object of mass M (Fig.) carrying a charge +Q is released from rest at the top of a smooth inclined plane of inclination θ. A magnetic field of flux density B acts throughout the region and is directed normally into the plane of the figure. Which one among the following statements is correct? (a) The acceleration of the object down the incline depends on Q but does not depend on B. (b) The acceleration of the object down the incline depends on B but does not depend on Q. (c) The acceleration of the object down the incline depends on both Q and B. (d) The acceleration of the object down the incline does not depend on Q and B. (e) All the above statements are incorrect. The component of the gravitational force along the incline is Mgsinθ which can produce in the object an acceleration gsinθ down the incline. 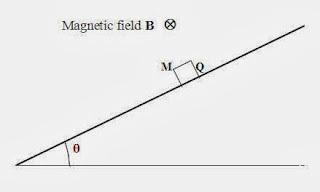 When the object moves down along the inclined plane, the magnetic force (Lorentz force) acting on the object is directed perpendicular to the inclined plane such that it tries to press the object against the inclined plane. [Apply Fleming’s left hand rule to arrive at the direction of the magnetic Lorentz force]. Since the magnetic force on the object is perpendicular to the inclined plane, it has no component along the plane. The acceleration of the object down the incline is gsinθ itself and is independent of Q and B [Option (d)]. (2) In the above question suppose the inclined plane is rough and the object is able to slide down. Which one among the following statements is correct? 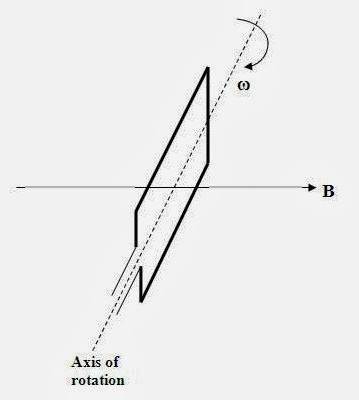 In this case the frictional force acting between the object and the inclined plane reduces the acceleration of the object. The frictional force F depends on the normal force N acting on the object. But the normal force (which is Mgcosθ + magnetic Lorentz force) depends on both Q and B since the magnetic Lorentz force is QvB where v is the velocity of the object. 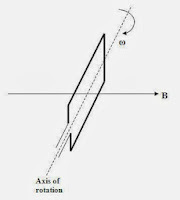 Therefore, the acceleration of the object down the incline depends on both Q and B [Option (c)]. φ = NAB cos ωt where A is the area of the coil. (4) In the transformer shown in the adjoining figure, the secondary winding has taps A, B, C, D and E. The number of turns between taps A and B is 100. The number of turns between taps B and C is 50, the number of turns between C and D is 40 and that between D and E is 10. The primary has 2000 turns and is connected to 220 volt A. C. mains. Between which taps will you obtain 5.5 volt output? 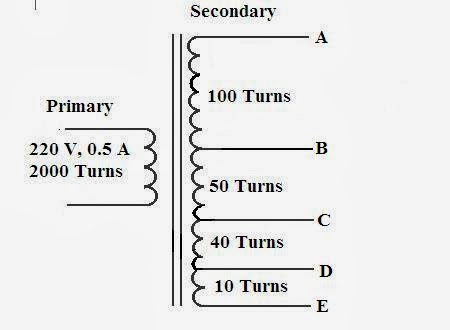 Since the primary voltage is 220 V and the number of turns in the primary is 2000, the induced voltage per turn is 220/2000 = 0.11 volt. 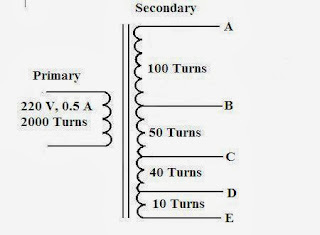 Therefore, the number of turns required to produce a voltage of 5.5 volt is (5.5)/(0.11) = 50. Since there are 50 turns between taps B and C as well as between taps C and E, the correct option is (c).